Still, not all have been quick to adopt the latest innovations. Many are still stuck in a traditional customer service strategy that is wasteful, inefficient and less effective in fostering optimal customer service. Are you interested in developing a next generetion proactive support for customer service? So what does next generation proactive support for customers look like? Well, it solves one of the main issues that traditional customer service doesn’t. At the core of this new strategy is the conscious effort to address issues before the customer even picks up the phone or reaches out to one of your agents. But doesn’t that require you to read minds? Well, not really. 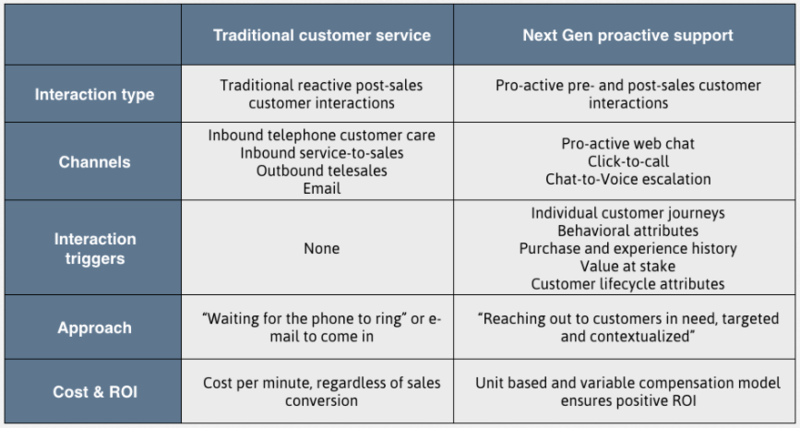 As you can see from the items above, next generation customer service is quite different from the traditional service model commonly adopted by many call centers. Let’s go through the advantages of proactive support. Before, traditional customer service call centers only provided support to customers after the sales process has been completed. It was a way to improve customer service and by extension, customer retention. With proactive support, next generation call centers can actively take part in the pre-sales process. This is achieved with the support of technological tools that allow you to initiate conversations with your website visitors when they trigger certain conditions such as scrolling in a specific area in your product page. Capable customer engagement platforms allow you to easily implement this and your proactive support model and allowing your agents to turn leads into customers. Adopting a proactive support model with the help of a customer engagement platform or software can open more support channels to reach your customers. Instead of concentrating on outbound calls to sell, try adopting proactive chat popups on your website. They’re far less intrusive since those that you initiate chat conversations with are on your website looking for your products and services. Advanced tools even allow you to escalate a chat to a voice call or even a video call giving you better chances during sales. And what about inbound support calls? Let’s examine this in the context of today’s habits. You basically want customers who need support to go to your contact page, find your contact number, dial it on their phones and wait for an agent. It sounds too tedious already. By adopting a next generation support, you can simply put call-to-action buttons on all your pages that will prompt a call right there whether they’re on their desktops, tablets or phones. Generating sales from digital today requires an updated marketing and sales strategy that involves buyer or customer personas that mould your online content to your online target market and customer journeys that trace and guide visitors to becoming customers through a carefully planned out conversion process involving social media, special website pages, landing pages, blogs and more. With the right call center software or tool, you can transform your call center from a cost center into a revenue generating arm of your business by making them a vital part of your digital strategy. For example, you can include some proactive communication features into your customer journey. You can view customers’ page views and activity on your site which can help your agents cross reference them against your buyer personas and make the agents aware of where the customer is in the buyer’s journey. This makes them more prepared to sell to them. With your call center now actively involved in your sales strategy, you can now adopt a unit-based and variable compensation model for your agents. In the past, you had to pay by the hour or even by the minute. You have costs that were charged on time rather than on performance. With the right tools, the right strategy and by empowering your agents to be capable of guiding a lead towards becoming a customer, you can encourage and reward them through the compensation scheme that’s both more cost efficient for you and more engaging for your agents. By changing your customer service model from a traditional one to proactive support, and by adopting the right tools that provide you with the necessary functionalities to adopt proactive support fully, you can improve your call centre immensely. When choosing a call center software, make sure it gives you the necessary backbone to implement proactive customer support. The strategy is good, but in the end, you’ll need the right tools to implement what you need.